Born in New York City, Dr. Gault’s creative and published works include books and 39 articles, more than 130 art exhibitions, 4 compact disc of original music, and US Pat. No. 5,726,111. Based in Seattle, USA New Century Arts, Inc. was founded in 1997. In 1970 through 1980’s Dr. Gault established a full time pottery, tile, and limited edition sculpture production clay studio in downtown Seattle. Clients included fine craft galleries and Nieman Marcus department stores can be seen in portfolios. Her fine art practice expanded again to fine art, sculptural wall work, installation, animation, video, and composer music by the 1990’s. She has exhibited and lectured internationally. Her work is documented in ceramic textbooks by Peterson, Rhodes, Nelson, Hopper and others. Her works are in public and private collections worldwide. Her international teaching on paperclay has served as a seminal resource impetus for several generations of artists who adapt, adopt, or add innovations and advance in paperclay ceramics. Titles include Paperclay Art and Practice 160 pp. (2013) from Bloomsbury in UK/Australia and University of Pennsylvania Press in USA/North America. Innovation in Paperclay Ceramics Ph.D (2013), Paperclay for Ceramic Sculptors (1993, 2014), Paper Clay (1998, 2006), and Think by Hand (2003), and Report: Collection of paperclay pot water filtration articles. (2012) and US Pat. No. 5,726,111. 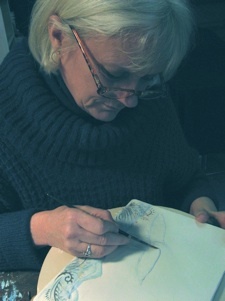 Her website paperclayart.com was launched in 1995. Dr. Gault has mixed and field tested her methods of paperclays by teaching, work periods, masterclasses and artist research residencies in New Zealand, Australia, Finland, Denmark, UK, Netherlands, Germany, Czech Republic, Hungary, Canada, with brief hands on visits in India and China and Sweden. In addition she has worked/studied/researched clays hands on in Italy, France, Spain, Switzerland, Mexico, Nicaragua, Colombia, Ecuador, Peru, Chile, Argentina, Brazil, Bolivia and Paraguay. After a collaboration with materials scientist Dr. David Kingery in 1992, and Ron Rivera in 2006 she later took her Seattle incubator lab online www.paperclaylab.net. to initiate further research and development of sustainable materials technologies involving recycled pulp/clay ceramics. Gault has been affiliated with CarCUOS Research Group.